Search for intelligent life in the universe. Planets That Might Support Life! 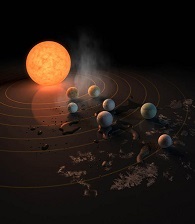 Artist's impression of what the TRAPPIST-1 solar system looks like. In a remarkable discovery made during late 2015 and published in the journal Nature during 2016-MAY, three planets were found revolving around a relatively nearby star. It is called TRAPPIST-1 (a.k.a. 2MASS J23062928-0502285) and is in the constellation of Aquarius. It is located a distance of 12 parsecs (39 light years, 230 trillion miles or 370 trillion kilometers) from Earth. A second discovery was that the planets are somewhat similar to Earth. Some -- perhaps all -- of the planets lie in the habitable region of their solar system. That is, they have a surface temperature that would permit water to exist there in liquid form. Liquid water is generally regarded as a necessary precondition for the formation of life on a planet. TRAPPIST-1 is a dwarf star that is only slightly larger than our planet Jupiter. It has a mass of about 8%, and a diameter of about 11%, that of our Sun. Its planets' orbital periods -- the length of their year -- range from 1.5 to about 20 days. The planets' average distance from their sun range from 0.011 Astronomical Units (AU) to 0.06 AU. This compares to Earth at an average of 1.0 AU from our Sun. Michaël Gillon, an astronomer at the University of Liège in Belgium, is the lead study author. The planets were detected using transit photometry using the Transiting Planets and Planetesimals Small Telescope (TRAPPIST) at the La Silla Observatory in Chile. This technique involves observing how the light from the star dims as each planet passes in front of it. 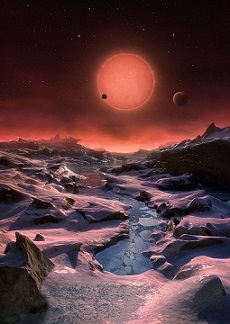 "I don't think any time before we had the right planets to discover and find out if there was (life). Here, if life managed to thrive and releases gases similar to what we have on Earth, we will know." "This discovery could be a significant piece in the puzzle of finding habitable environments, places that are conducive to life. Answering the question 'are we alone?' is a top science priority. ... Finding so many planets like these for the first time in their [star's] habitable zone is a remarkable step forward toward that goal." planet to the right of the star. "... excitement [among some scientists] over the possibility of extra-terrestrial life simply confirms [a longstanding assumption that] surely life must exist somewhere [else] in the universe. [That assumption] has been a theme of writers for centuries, and we shouldn't expect it to wane. ...For Christians, there is already a hope that there is life elsewhere, but we don't need to find it in some other planet. It is found in the promises of God, revealed in the human-divine person of Jesus of Nazareth." The discovery of "... other planets around other stars should be no more surprising to us today than the discovery of rocky planets in our own solar system centuries ago. The Bible begins with the creation of the heavens and earth. These discoveries do not dispute that." Scientists will attempt to study the atmosphere of these planets in the hopes of detecting the presence of gasses like oxygen, ozone and methane that might indicate biological activity. This study will likely take five years until 2022. "... will be no dashing [some scientists'] hope" of life in TRAPPIST-1. [Believers should remember the TRAPPIST-1 planets are governed by scientific laws] "... actively upheld by a powerful and loving God ... nothing about the discovery of Earth-sized planets around a dim star affects the Christian narrative of Creation - Fall - Redemption - Glorification." "In the beginning God created the heaven and the earth. ..."
The "Fall" that Nettles refers to is seen later in Genesis, at Chapter 3. It contains a story in which Adam and Eve violated the instructions of God by eating the fruit of The Tree of Knowledge of Good and Evil. The first couple apparently had been created like the rest of the animals without a moral sense. They were driven only by instinct. By eating this magical fruit, their brains were rearranged and they suddenly developed a moral sense of good and evil. This is referred to by many Christians as "Original Sin" and "The Fall" of humanity. They further believe that the sin and its punishment were transmitted to Adam and Eve's children who were not involved in the eating of the fruit. It was further transmitted to their grandchildren, and continuing on hundreds of generations to present day humans. However, some liberal Christians and secularists refer to the event as a myth about the "rise of humanity" -- the time when humans first became motivated by ethics, and morality, along with instincts. They had become fully human. About Genesis 3: The fall or rise of humanity and original sin. Scapegoating: Transferring sin and punishment from one or more guilty person(s) to others who are innocent. Image by ESO/M. Kornmesser at http://www.eso.org/public/images/eso1615a/ CC BY 4.0 (http://creativecommons.org/), via Wikimedia Commons.